Once you have created a session it is possible to make minor adjustments to some of the details of the session. You can change the following. The Number of places available for trainees to register. (Note: If the number of trainees registered already exceeds the available places, trainees will continue to be registered for the session). The Instructor assigned to the session. To access the details of an individual session, navigate to the sessions overview via Manage > Sessions. 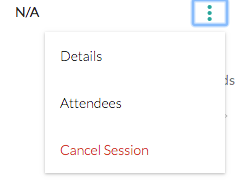 From the list of available sessions, select 'Details' from the drop-down menu. You can also click the link on the session date to be taken to the sessions details page.